Tuesday, May 8, 2007 is the Feast of Our Lady of Pompei. In Italy and in places all over the globe the feast will be marked by the solemn recitation at noon of Blessed Bartolo Longo's moving prayer, the Supplica, meaning supplication or petition. 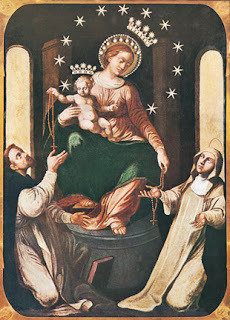 The Supplica is, of Blessed Bartolo Longo's published prayers to the Mother of God, the most famous. Its incandescent words have opened countless souls to the grace of Christ through the all–powerful intercession of His Mother. The Supplica is a prayer that people have made their own. It is known on every continent; it has been translated into hundreds of languages. No authority ever imposed it, it is not part of the liturgy of the Church, it was never submitted to revision by ICEL, and yet, it has become universal. Sociologists of religion, take note! Translators of liturgical texts, wake up and smell the Italian coffee! Certain rationalistic types disdain the Supplica. They see it as representative of an unenlightened, sentimental, southern Italian piety bordering on superstition. They find its emphases embarrassing, its display of emotion unnerving. The literary style of Blessed Bartolo Longo is the expression of his own character. He was capable of gentleness and of passion. He was, like all meridionals, rich in sentiment and quick to express it both in song and in tears. He was moved, before all else, by the reason of the heart. Blessed Longo was a lover of Truth; but his particular grace was the discovery of Truth through love. He found Truth, not in syllogisms and in concepts, but in the Heart and on the Face of the Word Made Flesh in the womb of the Virgin, and held in her arms. The Rosary was the means by which, at the age of twenty–eight, a confused and desperate Avvocato Bartolo Longo — a practicing Satanist and medium at the time — was converted to the Truth and delivered from the powers of darkness. He vowed that he would spend his life proclaiming to others the Rosary's liberating and healing power. This is why, at the end of the Supplica, he exclaims: "O blessed Rosary of Mary, sweet chain which unites us to God, bond of love which unites us to the angels, tower of salvation against the assaults of hell, safe port in our universal shipwreck, we shall never abandon you." The Supplica may not be everyone's cup of tea. Even pious folks may find it a bit too baroque, a bit overdone. It may be the southern Italian blood (mixed with Irish) that runs hot in my veins, but I love the Supplica and I plan on saying it with thousands of other people at noon on Tuesday. It is the prayer of a man very like myself: a poor sinner who fears nothing when he holds the Rosary in his hands, knowing that the Mother of God holds her end of the chain, and will not let it go. I include the Supplica in my book The Church's Most Powerful Novenas , beginning on page 175, you can also find the text of it at Vultus Christi. Fr. Z has information on the Indulgences that can be gained by praying this prayer as well as an MP3 of the Supplica.